"Great advice. Nice, simple and, most importantly, effective. From an employer's perspective your prices were far more agreeable than the other quotes we took, and your report turnaround period of just 24 hours greatly helped all concerned. We can visit your pre-existing premises or prior to any new office opening or refurbishment, to ensure workstation equipment is matched to your employee demographic and the computer peripheral equipment is compliant for the task for which it is being used under PUWER (Provision and Use of Work Equipment Regulations). The DSE risk assessment includes a basic review of employee anthropometric measurement data, checking the core equipment of desk, visual display unit (VDU) and seating, the generic role remit and tasks performed by employees, and a basic environmental reconnaissance. Reports are returned within two working days, but usually twenty-four hours. While ensuring your legal compliance at the basic level, a DSE assessment may fail to reveal the contributive causes of recalcitrant musculoskeletal issues that are experienced by individual employees. Problems such as chronic neck and back pain, carpal tunnel syndrome, tennis elbow, and shoulder pain can make it difficult for an employee to work to the best of their ability. Invariably such cases require in-depth, cross-professional expertise and assessment to highlight those subtle factors which may be contributing to lack of symptom resolution. For your employees lying within this definition Lakeside Physiotherapy and Ergonomics can perform a ‘Complex Workstation Assessment’ (CWA). A CWA involves a detailed examination and thorough assessment of the employee’s issue, tasks, seating, movement and posture analysis complete with photos, and workstation equipment and configuration, to ascertain potentially injurious causes of the problem. Lakeside Physiotherapy and Ergonomics can then make any changes required in-situ on the day combined with any employee education salient to the problem. A detailed report will be returned within forty-eight hours suggesting any recommendations that may be deemed reasonable adjustments under DSE, and The Equality Act. Prolonged periods of static sitting on an ongoing basis can cause discomfort and pain for anyone without musculoskeletal issues, but particularly for those who are ageing or who have mobility issues. Occasionally an employee requires bespoke seating that satisfies a specific medical need, or simply because their dimensions entail that they cannot achieve comfort in generic seating. 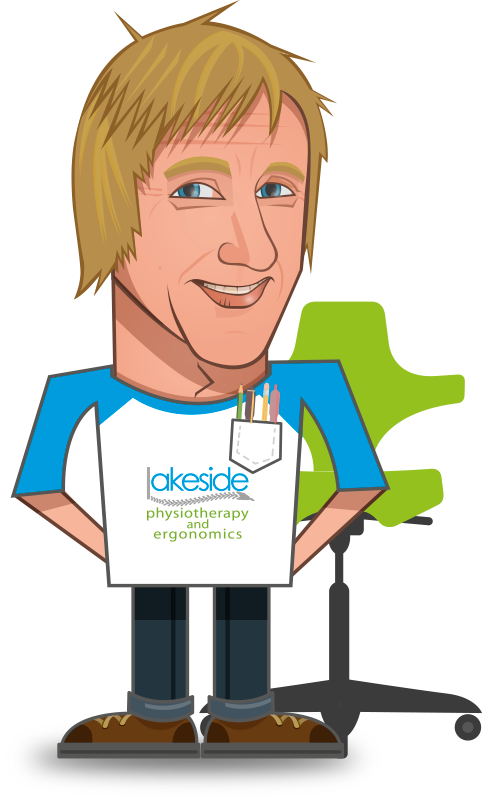 Lakeside Physiotherapy and Ergonomics can provide pre-purchase advice of standard seating for your premises, or provide expert assessment, advice and recommendation when choosing chairs bespoke to those with complex needs and/or performing several tasks. While seating is a core component of any workstation naturally the chair is only one part of a cohesive system configured to a functional end. Therefore all our seating assessments and reports (within forty-eight hours) incorporate a review of role-remit, posture, anthropometric measurements, computer peripheral devices and their positioning as well as desk review with regard to thigh and leg clearance. Lakeside Physiotherapy and Ergonomics has experience of the varied and complex needs of wheelchair users through our past work within Peterborough Hospitals Foundation Trust. (WUEA). The WUEA consists of a thorough assessment of your work premises to ensure the user has access to all areas used by colleagues without disability as stated by The Equality Act. Whether this be checking adequate turning radius for wheelchair dimensions, evaluating sufficient thigh clearance and space for exit and egress from the desk, or appropriate positioning of peripheral equipment Lakeside Physiotherapy and Ergonomics will assess, make changes, and report within 48 hours. Many employees, in addition to the ranks of self-employed, work from home on account of the temporal-fiscal advantages that home-working affords over commuting, or the simple wish to work more flexible hours around their childcare commitments. However creating a DSE-compliant or comfortable working position with standard desktop PC solutions is often difficult for those without expert knowledge, let alone using domiciliary furniture that is largely incompatible (and potentially injurious) with mobile media such as tablet and fixed-screen laptop devices. If this scenario sounds familiar and you’re searching for either a personal solution or one for an individual in your employ, then Lakeside Physiotherapy and Ergonomics has the answer. We can perform a home visit and perform an assessment of needs based on your role-remit, anthropometric measurements, postural style, pre-existing furniture, device type, room/accommodation, children and pets (! ), in order to make sure you have the right environment for effective and comfortable computer use. Where necessary we can make changes in-situ, provide advice, or suggest any recommendations regarding equipment including, if you choose, definitive items and potential suppliers. Contact us now. It’s not unusual for Lakeside Physiotherapy and Ergonomics to assess and treat sales executives who are required to drive up to or more than 30,000 miles per year in their role. Despite contemporary improvement in the ergonomic design of cars and the ability to tailor seating, steering wheel, and in-vehicle entertainment to our bespoke individual needs it’s no surprise to find that many drivers continue to experience significant problems with back, neck, knee, and shoulder pain through inefficient driving position or inefficient postural habits. A specialist individual assessment by Lakeside Physiotherapy and Ergonomics can however lessen the pain of driving, helping you achieve greater comfort while traveling, and meaning you reach your destination not only safely but in a positive frame of mind to work effectively or clinch that all-important deal. Our comprehensive Vehicle Ergonomic Assessment begins with an individual musculoskeletal assessment in the clinic to ascertain focal areas of pain, while also providing baseline data regarding joint integrity and muscle flexibility which could create issues when combined with inadequate in-vehicle configuration. We will then assess the employee in the vehicle while parked and also on a short journey to review posture, habits and equipment configuration that may prove detrimental from a musculo-skeletal perspective while on the move. Next we review any work practice that needs to be performed in the car using electronic media, with respect to space available and devices used. Storage space and moving and handling of work equipment are reviewed to ensure good technique. Throughout Lakeside Physiotherapy and Ergonomics will advise on sitting posture and driving techniques, assist in making any seating adjustments that will facilitate a more efficient driving position, ensure you know how to adjust your seat correctly and move equipment efficiently, instruct in the use of back supports where necessary, and optimise the use of space and devices for effective e-working. As per all our assessments you will receive a bespoke report within forty-eight hours of your assessment. Is your business or organisation contemplating the introduction of a new piece of equipment or industrial process to improve productivity? Have you considered the implications for your employees’ health and wellbeing? Or your customer satisfaction levels and their potential ramifications through social media in a 24/7 digital age? Or are you simply experiencing a high level of injuries and accidents but can’t ascertain the cause(s)? Lakeside Physiotherapy and Ergonomics can review both products and process from a usability and risk assessment perspective and report back to you on potential or pre-existing problems in your workplace. Invariably we will be able to assist in terms of injury reduction, positive employee engagement and customer satisfaction, and sometimes all three! We recently advised a local dealership regarding the inefficient configuration of their service department workstations, in order to decrease the likelihood of employee spinal pain, while simultaneously facilitating positive point-of-sale customer relations during personal data transaction. Lakeside Physiotherapy and Ergonomics to the rescue! Now what can we do for your business?